Playing No. 1 singles, Bluffton’s Erin Hotmire hits a forehand return in a match against the Celina Bulldogs at the Bluffton courts. Hotmire picked up the win for the Pirates. See more photos from Bluffton tennis at Celina. ARLINGTON — Lima Central Catholic captured first at the Lady Trojan Invitational at Sycamore Springs Golf Club Monday. The Thunderbirds posted a 332 to snare top team honors. Notre Dame Academy was second with a 346 followed by Lexington with a 364. Rounding out the fielder were Oak Harbor with a 376, Van Buren 397, Akron Hoban 403 and Findlay 421. Individual for LCC, Meghan Mulcahy led the T-Birds with a 78 with Mary Kelly Mulcahy firing an 80. Erin Mulcahy came in with an 81 and Hannah Gerber finished with a 92. Findlay’s Chloe Holiday and Van Buren tied for medalist honors by shooting a 76. DELPHOS — Bluffton’s Alivia Koenig fired a 44 to capture the medalist spot and help guide Bluffton to a win over Delphos Jefferson, Bluffton and a partial Ottoville team at Delphos Country Club Monday. Bluffton shot a 206 and Delphos Jefferson shot a 212 on the day. In addition to Koenig’s low score, Mara Minnig shot a 46, Kennedy Coughlan shot a 48 and Jocelyn Ochoa had a 68. For Jeferson, Ann Fitch came in with a 49, followed by Sydnie McGue had a 50 and Riley Smith put in a 55. Kaylee Buzard shot a 58, Alivia Carpenter had a 65 and Emma Mueller had a 68. Ottoville’s Ally Honigford shot a 47 and Hannah Hoehn had a 57. The Lady Panthers came away with the victory: 219-237. Medalist was Parkway’s Haylee Stukey with a 52, closely followed by Mecaylah Hesse and Alli Vaughn (Ft Recovery) who both had 53’s. Autumn Ellis had a 54 and Madison Kroeger rounded out scorers with a 60. Non scorer for Parkway was Lauren Henderson with a 68. For Ft Recovery behind Vaughn was Shelby Stammen with a 60, Jalyn Bruns with a 61, and Devin Jutte with a 63. Nonscorers were Becca Wood with a 71 and Reagan Grieshop had a 73. LIMA — Shawnee’s Morgan Atlenbach captured medalist honors after shooting a 40 to help the Indians to a tri-meet victory over Western Buckeye League foes Celina and Defiance at the Oaks Monday. For Shawnee Jeanna Fullom shot a 46, followed by Taylor Burgess 46, Maggie Gray 48, Molly Haas 53 and Addie Hilden 73. Celina’s Kendra Marsee came in with a 46 with Madelyn Sudhoff shooting a 48 followed by Emma Sweeney 50, Emma Whistler 63, Ashtyn Huber 67 and Maddie Harden 71. St. Henrys’ Ellen Nauman captured medalist honors with a 43 and helped ST. Henry to a win over Coldwater at the Mercer County Elks Golf Club Monday. Other St. Henry scores were Claire Clune (45), Elizabeth Rockwell (49), Callie Hemmelgarn (55), Abby Gast (59), and Alan Siefring (62). For Coldwater, Lexi Wright shot a 50. Other St. Henry scores were Sarah Diller (51), Grace Buscher (53), Emma Eckstein (57), Laney Finke (57) and Abby Ashbaugh(71). 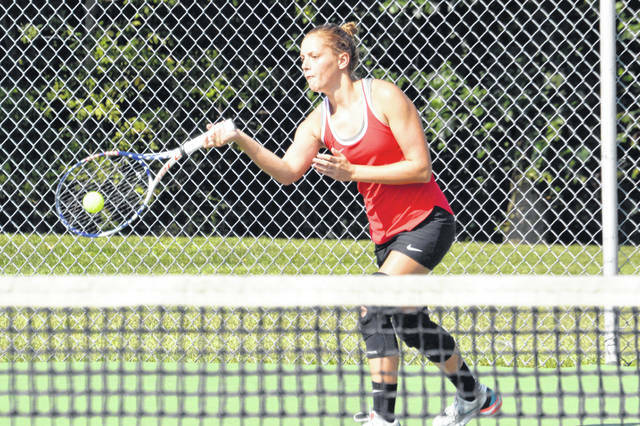 Lima Central Catholic got singles wins from Olivia Kesner, Anna Janowski and Morgan Chaney and a doubles win from the duo of Madie Brinkman and Cameron Guagenti. Elida’s lone win came from the No. 2 doubles team of Aariah Rojas and McKenna Shellhouse. BLUFFTON — Bluffton got a singles win from Erin Hotmire and doubles victories from Emma Klingler and Caity Zimmerman and the No. 2 singles team of Amelia Mitchel and Julia Smallcombe. Celina got singles wins from Sierra Zuercher and Kaylin Avers. https://www.limaohio.com/wp-content/uploads/sites/54/2018/08/web1_buten001.jpgPlaying No. 1 singles, Bluffton’s Erin Hotmire hits a forehand return in a match against the Celina Bulldogs at the Bluffton courts. Hotmire picked up the win for the Pirates.